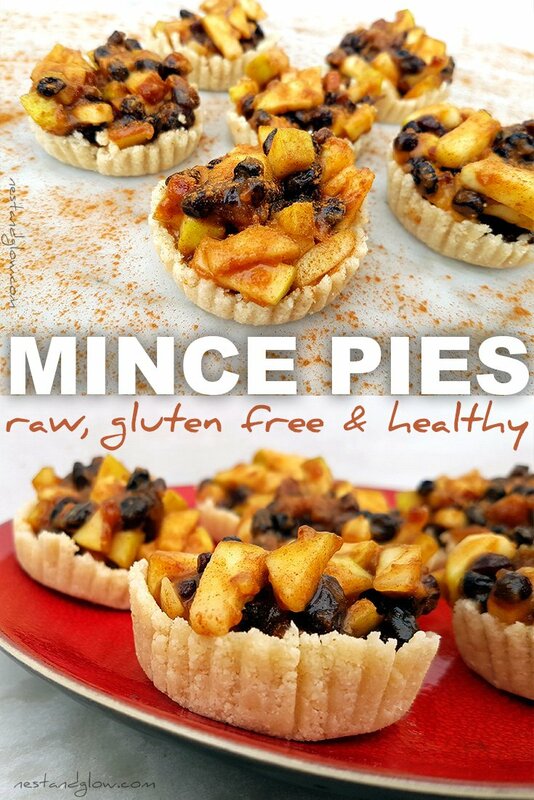 No bake raw mince pies recipe that’s gluten free and healthy with loads of fresh fruit. They are fun to make and taste delicious with a blend of spices. Loaded with nutrition making them a perfect guilt free healthy treat. 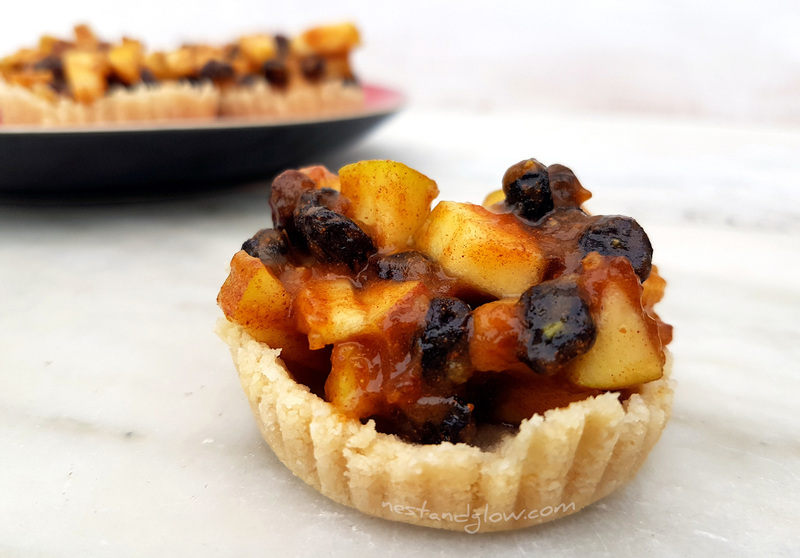 The mince pie crust is made from almonds and coconut and the topping is just fruit and spices without refined sugar. Bursting with nutrition from apples, raisins and dates. Suitable for gluten free, grain free, flour free, vegan, raw food, refined sugar-free and plant based whole food diets. These healthy mince pies are full of fruit and heart healthy fats. They are actually far easier to make than traditional pastry mince pies. The only downside is that they can be a tad crumbly if they have been out of the fridge for long as the coconut oil begins to melt. You can make your own coconut butter to use instead of coconut oil if you prefer. I couldn’t find a raw vegan mince pie recipe that was any good – they were either nothing like mince pies apart from the name or very time consuming so I invented these easy raw mince pies. Make these mince pies with an organic lemon if you can find one as the peel will be unwaxed and safe to it. The peel is very important to add in this recipe as it gives the bitter flavour and enhances the depth. You don’t really taste the peel as its just a small amount to ad subtle bitter tones. Lemon peel is such an important ingredient that’s vital in lemon recipes like sweet potato falafel and lemon drizzle cake. You can’t have these raw mince pies warm as they will crumble, think of them as a fridge cake. The raw mincemeat filling you can use as a filling for other pie cases or crusts if you don’t like almonds. I have made some good cases with a mix of oat flour, almonds and coconut oil but you have to bake these. A baked case will be firmer, but most of the time I just use this recipe as it’s so much easier and quicker. The apples are finely cut, but they don’t oxidise too much as they are coated in the sauce of sweet dates and sour lemon juice. 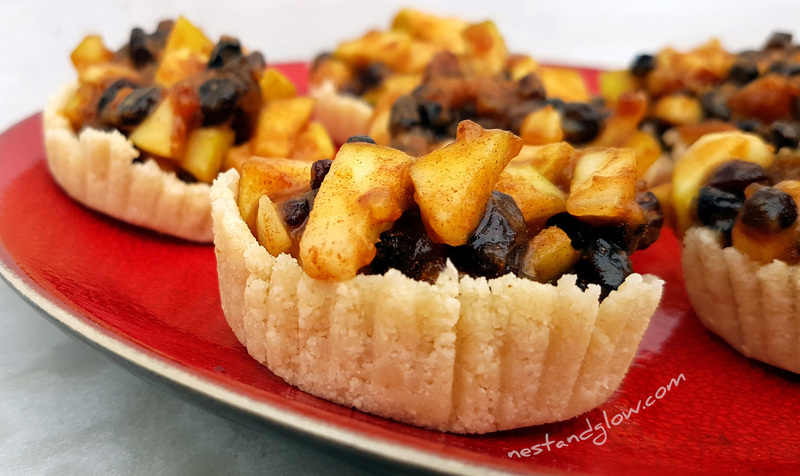 The lemon juice naturally preserves the apples in these raw mince pies and even enhances the texture as it softens the apples making them seem less raw. You do need to keep the mince pies in the fridge and eat within a few days of making. I have tried freezing these healthy mince pies and they come out tasting nice, although the texture is a bit softer. 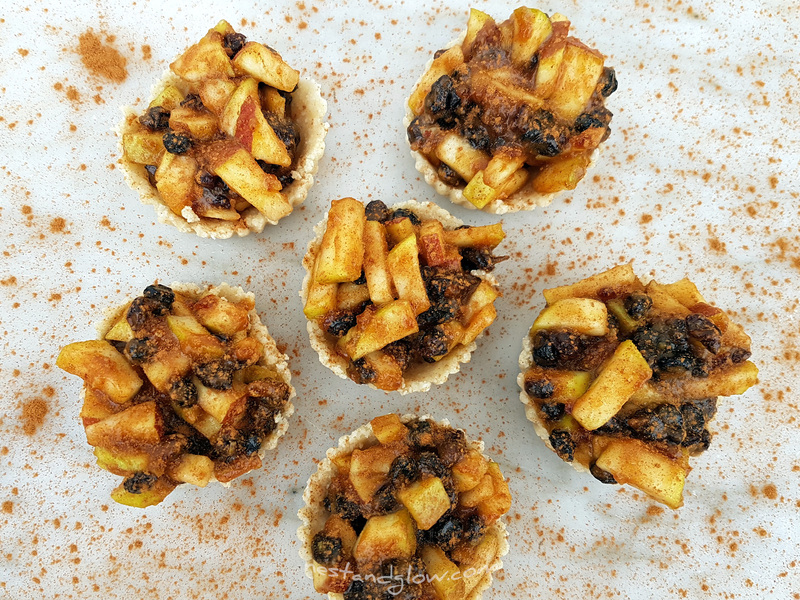 Use any eating apple you like for these mince pies. I just used the apples I have growing in my garden as have so many to eat during autumn. If you want to make a nut free raw mince pie then replace the ground almonds with a mixture of ground sunflower seeds and buckwheat. Do a proportion that you like the taste of. This gives an earthier less sweet flavour, but with the very sweet raw mincemeat topping, they will still be delicious. These healthy and gluten free mince pies are great on their own but if you fancy a bit more decadence add some cashew cream. Try my raw cashew custard from my apple crumble recipe for a raw sweet sauce. The golden colour comes from a pinch of nutrient-dense turmeric that you don’t taste. Traditionally mince pies were made with meat and were in an oval shape to represent the manger that Jesus slept in. Over time the meat has been replaced with fruit and spices, just like Christmas pudding, although some brands do still contain animal fats. These healthy mince pies are just made of plants and have all the taste with no guilt. Melt the coconut oil or butter and mix with the almonds and sweetener to make the crusts. Push into cases, paper or reusable silicone ones both work and then place in the freezer while you make the filling. I try to get the crusts to start going up the side a bit, but not too far as the mixture is crumbly. Blend the dates with the lemon juice and zest. You may need to add a bit of water to make the mixture smooth. Mix together all the other mince pie filling ingredients. Fill the crusts with the mincemeat filling and then place raw mince pies in the fridge until ready to eat. Enjoy the healthy mince pies within 3 days and keep in the fridge. His look amazing!how are they frozen? ?